How to do maintenance for jaw crusher in granite crushing plant? NewsHome > News > How to do maintenance for jaw crusher in granite crushing plant? In modern construction and mining industries, Jaw crusher are widely used in granite crushing plant and aggregate crushing plant. Jaw crusher features of wide feeding size and extensive application, our jaw crusher can process granite, basalt, bauxite, pebble, iron ore,limestone, quartz sand and so on. 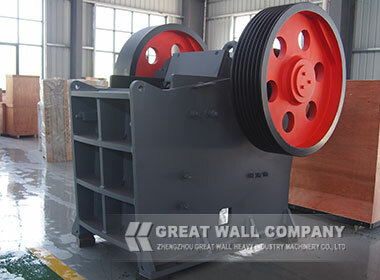 Great Wall Company recommend you that We should not only know clear about operation manual of jaw crusher, but also do the regular inspection for jaw crusher. How to do maintenance for jaw crusher in granite crushing plant? Firstly, jaw crusher operators should check jaw crusher components regularly,guarantee the stable performance of belt pulley, eccentric shaft, tension rod and spring. On the second, we pay attention to crusher wearing parts , such as jaw plate(movable jaw plate and fixed jaw plate) and side plate. On the third, we should find the jaw crusher problem and replace the abrasion wearing parts in time. If you have any other questions on jaw crusher machine, please feel free to contact with our online service. Professional stone crusher engineers provide you tailored solution and technical supporting. Previous: What kinds of stone crushers used in cement grinding plant ? Next: What are technical advantages and disadvantages of impact crusher in stone crushing plant?